Compare the LX 570 to the Toyota Land Cruiser and you'll find that they offer a surprisingly different driving experience. Amazingly refined, the Lexus LX 570 hides its utilitarian roots exceptionally well. Think of the 2017 Lexus LX 570 as a UN Peacekeeper in a tuxedo. Underneath its glitzy, eye-catching exterior and behind its soft leather and glossy wood sits a Toyota Land Cruiser, one of the most capable and over-engineered vehicles to ever hit the road. There's just one LX 570 model available, but it can be dressed up with a few options. There's no getting around the LX 570's sharp beak; you either love it or you hate it. We like the heritage-inspired look seen on the Toyota Land Cruiser more, as we think it's generally a more cohesive SUV all around. The two differ in their front and rear styling and in their detailing, with the Lexus clearly looking like the more bucks-up variant that it is. Lexus' bold "spindle" grille has been spread across its entire lineup over the past few years, but its execution here seems at odds with the SUV's rather bulbous side profile. On the other hand, the L-shaped tail lamps that stretch across its two-piece tailgate seem better integrated (the glass pops up, while the bottom section folds down to create a bench). Sharp 20-inch wheel are standard, with 21s optional. Hiding beneath that facade is a very capable off-roader, albeit less of one than the Land Cruiser. Although they share the same frame, powertrain, and basic suspension design, there are considerable differences. For one, the LX 570's styling gets in the way of its approach and departure angles. Should you find yourself trying to climb a steep grade, there's a good chance you'll make the costly mistake of adding some additional creases to the front grille and bumper assembly. Additionally, the LX 570 makes use of an electro-hydraulic suspension that allows the vehicle to be lowered or raised at the flip of a switch. At its highest setting, the LX 570 sits up proud, while it hunkers down for easy ingress and egress at low speeds. By contrast, the Land Cruiser uses the same basic independent front and coil-sprung solid rear axle setup, but it suspension isn't height adjustable. Instead, the Land Cruiser utilizes ultra-thick sway bars that disconnect automatically. The benefit here for the Lexus is that its suspension smothers bumps with aplomb, even when outfitted with the 21-inch wheels that force a tiny sidewall. The Land Cruiser, meanwhile, rides a little more ponderously, but its suspension can flex more for off-roading. That's where the two diverge; they share the same 5.7-liter V-8, rated here at 383 horsepower and 403 pound-feet of torque. That power is routed to all four wheels via a 8-speed automatic gearbox and a full-time four-wheel drive transfer case (that even includes a low range for serious off-road duty). 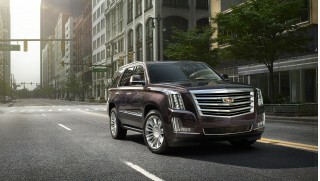 Those are big numbers, but the LX 570 weighs 6,000 pounds, meaning it's not exactly spry off the line. The tuxedo side of the LX 570 is evident the moment you open a door. Its interior is decked in luxurious leather and glossy wood trim. Finally, last year's redesign gave the LX 570 a distinct dashboard and center console not shared with the Land Cruiser. That's a good thing, since the Land Cruiser feels a little too rugged for its price point inside. There's terrific room for five adults, but the third row jump seats are occasional use at best. 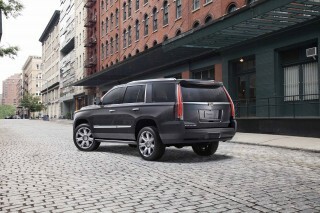 While they're better now than they've ever been on the LX, rivals feature power seats that stow away much more easily. For 2017, Lexus has made some important safety tech standard: automatic emergency braking, adaptive cruise control, and automatic high beam headlamps are now standard on all models. While the LX 570 hasn't been crash tested, it should perform well given its bulky size and its huge amount of pre- and post-crash features. All LX 570s are downright luxurious, but an optional Luxury Package bumps them up to proper high-end territory with sumptuous semi-aniline leather seats and a wide array of wood species and finishes for the dashboard and door panels. Unlike the Range Rover, there's not as much customization potential here—but then again, a loaded LX 570 is under $100,000, which is where you're just getting started in a Rangie. It's safe to say that you're probably not looking for a fuel sipper at this price point, and to that end the LX 570 delivers exactly what we expect: a penchant for premium unleaded. It's rated a lousy 15 mpg combined. Though its exterior is an acquired taste, the LX 570 is a stunner inside. 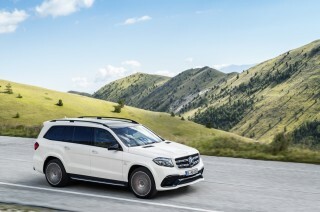 For the first time in the LX's now two decade-long history, this SUV finally stands out compared to the functionally identical Toyota Land Cruiser. Visually, the LX looks more massive than its proportions actually suggest. By the numbers, the LX 570 stretches an even 200 inches from head to toe. That's about 5 inches longer than the Land Cruiser thanks to the Lexus' sharp proboscis. There's no escaping that sharp, beak-like grille that is a rather unconventional attempt at transferring the brand's now-signature "spindle" grille design onto its SUVs. We do like the LX 570 more from the rear, however, where its tail lamps are more cleanly integrated into the sheet metal than the Land Cruiser. Like the Toyota, the LX's tailgate is a split design; the top opens up like a hatch, while the bottom portion flops down to create a convenient bench (albeit one that requires a hefty liftover for loading items into the cargo area). The LX's interior is more subdued certainly than its exterior. If not for its basic proportions and the commanding view out the windshield, you could be forgiven for assuming that the two were unrelated vehicles. The LX's dashboard is more carlike, with controls logically-arrayed below a wide infotainment screen. The organization is a little more haphazard in the center console thanks to a myriad of off-road switches that, frankly, most owners are unlikely to touch. Lexus offers a variety of interior schemes and upgraded materials on higher-spec models, allowing for more degree of customizability here than in the one-size-fits-all approach Toyota takes with the Land Cruiser. It won't encourage you to hit the twisties, but the LX 570 is one of the most comfortable-riding vehicles on the planet. Despite its chunky frame and generous ground clearance, the Lexus LX strives to be more of an on-road cruiser than an off-roader like its Land Cruiser cousin. For the way most buyers are bound to use their vehicles, the LX comes across as more comfortable and polished, if a little less true to its utilitarian roots. There's a lot of conflict here given that the LX is, under its skin, the same Land Cruiser that UN Peacekeepers need to rely on in remote places. Yet that's not to say that the LX is merely a work truck with leather seats, as it once was. Instead, it diverges significantly from the Land Cruiser. First, here's what's unchanged: Both the American-market Land Cruiser and the LX 570 utilize a 5.7-liter V-8 rated at 383 horsepower and 403 pound-feet of torque. Channeling power to all four wheels via a 8-speed automatic transmission, the engine moves the hefty 6,000-pound Lexus with reasonable authority. You won't win a drag race, but it is remarkably fast for such a large vehicle. Passing power, even at higher elevations and up steep grades, is always strong, with even more in reserve. And the engine emits a muted snarl that seems appropriate. With its trailer hitch, the LX 570 can tow up to 7,000 pounds. Underneath, the LX features the same independent front and coil-sprung solid axle suspension as the Land Cruiser, but the two differ in some key add-ons. While the Toyota uses a trick sway bar system to improve its off-roading, the Lexus' suspension is a height-adjustable electro-hydraulic unit. At the tug of a lever, the suspension can be raised or lowered to either improve ground clearance or to allow for easier ingress and egress. While that improved clearance might suggest off-road ability, as well as a five-mode terrain control system that allows the driver to select traction management depending on the terrain they're about to traverse, the LX isn't really an off-roader like the Land Cruiser is. Its front end significantly reduces its angle of approach, meaning it won't take a very steep incline to scrape up its (presumably expensive) front bumper. Additionally, the Lexus' standard 19-inch and optional 20-inch alloy wheels are wrapped in lower side profile tires than those seen in the Land Cruiser. If your definition of off-roading is driving on a snow-covered road on the way to the ski slopes, the LX 570 will perform exceptionally well. Yet if you're looking to truly explore the road less traveled, the Land Cruiser's more flex-oriented suspension and body designed to encourage off-roading make it the superior choice. That said, it's hard to beat the either for traction. Their standard four-wheel-drive system uses a Torsen limited-slip locking center differential to split power 40/60, front to rear and the aforementioned traction control switch lets drivers tailor the electronic nannies to the kind of roads (or lack thereof) they're encountering. Like the Land Cruiser, there's a Crawl Control system that lets the SUV automatically move at very low speeds with minimal driver input for very serious off-road driving, and a separate system utilizes the traction control to make for a shockingly tight turning radius when off-road. Yet clearly Lexus admits that the LX 570 is a road-cruiser, and to that end it performs admirably. The way its suspension absorbs the worst kind of terrain puts it in the upper echelon of SUVs. It smothers out road imperfections to such a high degree that drivers may wonder why everyone else is complaining about potholes. 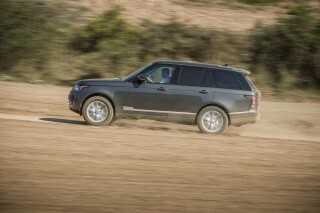 That doesn't mean that the LX 570 carves corners like the similarly dialed-in Land Rover Range Rover, however. There's no disguising the hefty wheel travel built into the basic suspension for off-road use, meaning there's substantial body lean. The steering, while nicely weighted, delivers minimal feedback from the road. With its decadent interior, the LX 570 is a wonderful place to guzzle fuel. Though it forces some minor compromises due to its truck-like frame, the Lexus LX 570 offers one of the most comfortable and well-appointed cabins on the market. Unlike previous Lexus LX models, the latest SUV's interior features a design that's distinct and not shared with the Toyota Land Cruiser. That's definitely a good thing since the Land Cruiser's inner trappings can feel a little more utilitarian than its over $80,000 price tag suggests. The LX's dashboard could have been plucked from one of the automaker's sedans. It's covered in nice materials and there are four different wood trim options available, including a beautiful open pore brown walnut. Controls are grouped logically on the instrument panel, but a myriad of switches await the driver on the center console. Most of these control the LX's numerous off-road functions and thus aren't the kind of thing the typical driver will mess with on a daily basis. The front seats are generously sized and covered in leather. They're soft to the touch, but supportive. Getting into them may take a try or two: the LX 570 requires a tremendous step up into the cabin, since its ride height is engineered to overcome off-road obstacles. It offers a ride-height control that can lower it about 2 inches for easier entry and exit, which helps. It also has added "Easy Access" features that include automatic retraction for the power-telescoping steering wheel, and automatic pushback for the driver seat, for more entry and exit space. The Luxury Package adds semi-aniline perforated leather that's both heated and cooled up front; most LXs leave the factory with this feature since, at this price point, budget is relative. A power-sliding function moves the second row 3.5 inches fore and aft to increase either leg or cargo space as needed. Though they're a little flat, the second row seats are properly adult-sized and the seat backs are split 40/20/40 to allow for a high degree of flexibility. The power-folding third-row seat is hard to get to, and it's quite cramped. While the second rows fold and flip fully forward to expand cargo space, the third-row seats flip up and rotate to the side—allowing, more easily, a flat, continuous load floor for longer cargo items. The disadvantage to the setup is that the third-row seats can't be completely removed, which narrows that available cargo space. The split rear tailgate features a power upper door, while the bottom section raises and lowers with minimal effort. Though it hasn't been crash tested, the LX 570 adds some important standard safety tech for 2017. Though its relatively low sales volume means it isn't likely to be subjected to crash testing by either the IIHS or the NHTSA, it's safe (pun intended) to say that it should perform well. As we expect at this price point, no key safety features are skipped in the LX 570's standard equipment list, from a total of 10 airbags, to stability control with off-roading modes, to active head restraints designed to reduce the risk of whiplash. A rearview camera is included in every model; an optional 180-degree front-end camera helps relieve some of the anxiety caused by the LX's tall, very flat front end. For 2017, the LX 570 gains a host of important collision avoidance features as standard: automatic emergency braking, adaptive cruise control, lane departure alert, and automatic high beams. As before, Lexus' Enform connectivity system with Bluetooth is standard, and it connects mobile apps to the SUV's audio system for what is claimed to be safer operation on the go. A safety telematics system is also standard and includes emergency notification services, and comes with a free year of service. The LX 570 lacks few creature comforts, although it isn't quite as whizz-bang as the Range Rover. 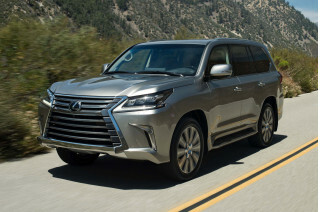 As its roughly $90,000 base price price suggests, the Lexus LX 570 is generously equipped with just about every technology in the automaker's toolbox—but it doesn't quite offer the astounding degree of decadence available on some rivals. 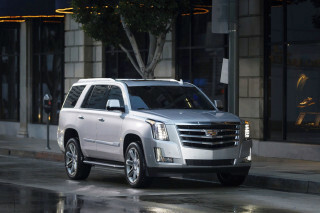 That may be fine for most buyers, since a loaded LX 570 tops out under $100,000. 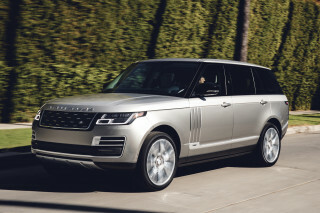 Head over to the Range Rover dealership and you're just getting started at six figures. 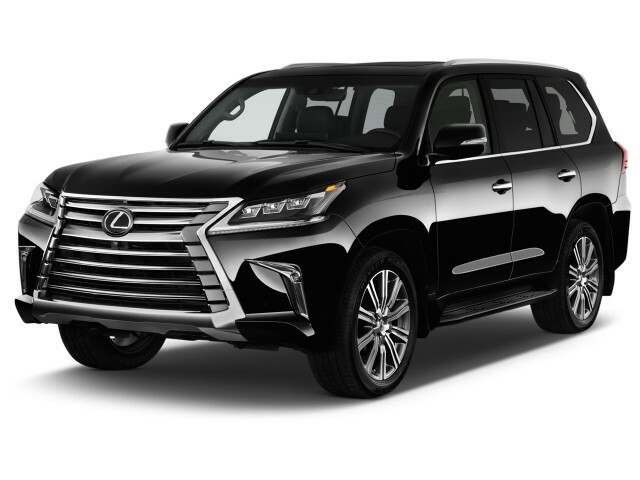 The standard LX 570 comes with automatic high beam LED headlights, 20-inch alloy wheels, leather upholstery, a 14-way power driver's seat, keyless ignition, a GPS-linked analog clock, and navigation. On the tech front, the LX 570 can parallel park itself and it now includes as standard automatic emergency braking, adaptive cruise control, blind-spot monitors, and enough off-road features to conquer the Kalahari. Options are limited to a Luxury Package that adds semi-aniline leather upholstery, a heated steering wheel, ventilated front seats, and heated second row seats. There's also a dual-screen entertainment system for the back two rows that offers wireless headphones and dual sourcing—which means users can run both a gaming console and a DVD player on the system at the same time, for example. A color heads-up display system projects the vehicle's current speed and some other important data onto the windshield. Finally, a 19-speaker Mark Levinson-branded audio system is also available; it's one of our favorites. Are you really worried about fuel economy if you're shopping for an LX 570? The Lexus LX may be one of the world's most capable off-roaders, but you'd better closely watch the fuel gauge if you're venturing far into the woods. The LX 570 is rated by the EPA at 13 mpg city, 18 highway, 15 combined. That puts it near the top of the EPA's "carbon footprint" scale. It's one of the least green vehicles currently on the market, although we've actually seen close to 20 mpg on the highway in the Land Cruiser. If anything, the LX may be a little more thrifty since its suspension hunkers down at highway speeds which should theoretically improve airflow. But, let's be honest, if you're reading this review, you're not in the market for something that will sip gasoline.